Despite being an aspiring makeup artist, and in contrast with some of my instagram looks, on a day to day basis I don't really wear much makeup at all. I have sensitive skin, and I find that when I overload my face, it just doesn't feel right on me. 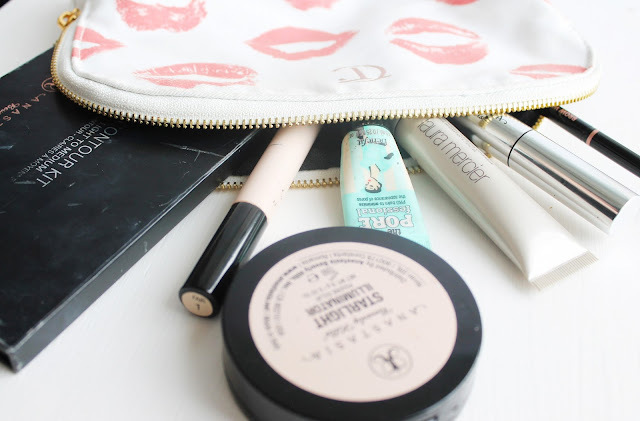 There are those days where I want to create an intense eye or lip look, but these makeup products here are my go to for a more 'chilled out' day. For me, this is my usual routine for when I'm at college, out running errands or at work. It's comfortable, simple and still makes you look like you put some effort in; and is suitable for anyone who likes makeup - pro or not. I don't prime my skin every day, but if I feel that I need it I tend to go for Benefit Porefessional, it does a great job at filling in large pores and smoothing out the surface of the skin. For my base, I like to use the Laura Mercier Tinted Moisturiser. It has SPF 20 and evens out the skin tone whilst providing some coverage and moisture - perfect during the winter months! To conceal my dark circles and any blemishes I may have, I use the Collection Lasting Perfection Concealer. It's the cheapest of cheap but has the most incredible coverage and longevity - I recommend this to anyone and everyone, especially those of you who may be starting out in makeup! To add a subtle definition to my face - as well as preventing me from looking like a legit ghost, I use the Anastasia Beverly Hills Contour Kit. I mix all of the contour shades together and place the product in the hollows of my cheeks, on the jaw line, the forehead and down the nose. It brings life back into my previously ghoulish complexion (pale problems). If you've seen any of my makeup looks, you know I can't live without my highlight! The ABH Starlight Illuminator is my favourite for bringing that dream glow! Finally, on days where I don't want a strong brow, I use my ABH Brow Wiz to create a more natural look. To finish, I use my ABH Clear Brow Gel to hold all my brow hairs in place, this really does set my brows and keep them looking great all day. As you can see, this little routine I've conjured up isn't too tasking or extensive, only involves a few simple products and takes approximately 5 minutes! What are your favourite products to use on a 'chilled' day?